• It is not demanding; you don’t baby-sit that compass. • It is intuitive; you don’t study a manual to learn how it works. • Everybody else knows how to use it, too. • It never gets lost…and who would will steal it? • It’s always ready when you are. • It came with the boat. You didn’t shop for it, nor pay for it, nor install it. • It works reliably 24/7 through rain, fog, even hurricanes. • It does not require a power supply (except for the optional night light). • It has only one moving part (and even that one part is self-lubricating). • It requires neither periodic downloads nor updates. • It never falls out of fashion. But if you want the compass to do its job – and be there for you when you need it – you must not abuse it. Just take a few simple precautions. Your compass will then be able to seek, find, and accurately display magnetic north. That’s how it helps you steer the boat and navigate. The following photographs show how several local skippers either abused their compasses or otherwise did something to compromise compass accuracy and reliability. Can you guess what’s wrong in these pictures? Stereo speakers contain magnets (which help the speakers to convert electrical energy to sound). Even one speaker, if installed in close proximity to a compass, will impose a strong magnetic deviation field on the compass and adversely affect compass function. Two such speakers, even if installed equidistant and 180º apart, will not compensate for each other and will almost certainly defeat compass accuracy. Depending on the size of the speakers and their magnets, they should be installed at least six feet away from the compass – the farther, the better. Note: Most magnetic compasses for recreational vessels are equipped with small internal compensating magnets. They can be adjusted to compensate for the adverse influence of external deviation, thereby improving compass accuracy. However, these internal magnets are very small and are not designed to correct deviation errors in excess of about 15º. Cup holders are convenient for securing paper, glass, and plastic beverage containers. But if the containers are made of materials containing ferrous metal, such as some of those popular metallic coffee containers, well, then, we’ve got a problem. You can’t use the compass (with confidence) until the offending object is removed. The cup holders are also a convenient temptation for the temporary deposit of binoculars; battery-powered VHF radios, mobile phones, and flashlights; work tools, pens and pencils, plotting tools, food service implements and other objects containing ferrous metals. (Note: Ferrous metals include iron, steel, and some of their alloys. In close proximity to a compass, objects made of ferrous metals will impose significant deviation errors on compass accuracy. Non-ferrous metals include high-grade stainless steel, aluminum, brass, copper, nickel, tin, lead, and zinc, as well as precious metals like gold and silver. Multi-function display units frequently have magnetic components, or are mounted with magnetic accessories and components. In addition, when some displays and other electronic instruments are energized, they create weak magnetic fields. Such systems should not be installed in close proximity to your compass. 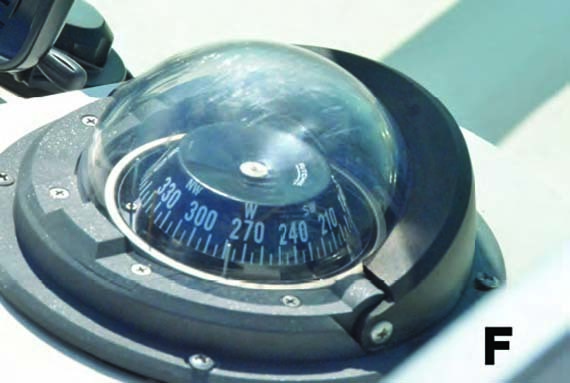 It’s important to remember that the typical magnetic steering compass is a sensitive mechanism. Moving an offending metallic object just a few inches in one direction or another, may alter the local magnetic field enough to convert a major deviation to a minor (correctable) deviation, or to no deviation at all (best). White VHF radio speaker. The speaker (a repeater) is only 9 inches from the compass. The speaker housing is plastic, but its bracket mount is steel, and of course the speaker has an internal magnet. The proximity of this fixture adversely affected the compass. Large black steel bracket which remained bolted in place after the skipper removed his old loran display unit. (Note rust on the base of the bracket: Rust is characteristic of ferrous metal.) The owner expected to use this bracket to mount a new radar/chartplotter display. Repositioning the speaker and discarding the old loran bracket removed more than half the compass deviation error. 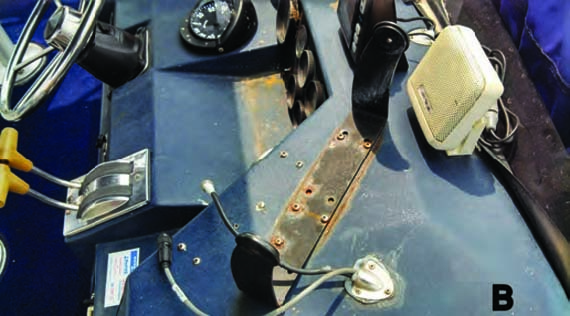 Balance of the deviation error was attributed to four steel bolts that secured the steering column flange to the console, and a solenoid and a steel reinforcing bracket beneath the console within inches of the compass base. These relatively minor deviation errors were eliminated by replacing the four steel bolts with stainless steel bolts, and by re-positioning the solenoid and steel bracket farther away from the compass base. 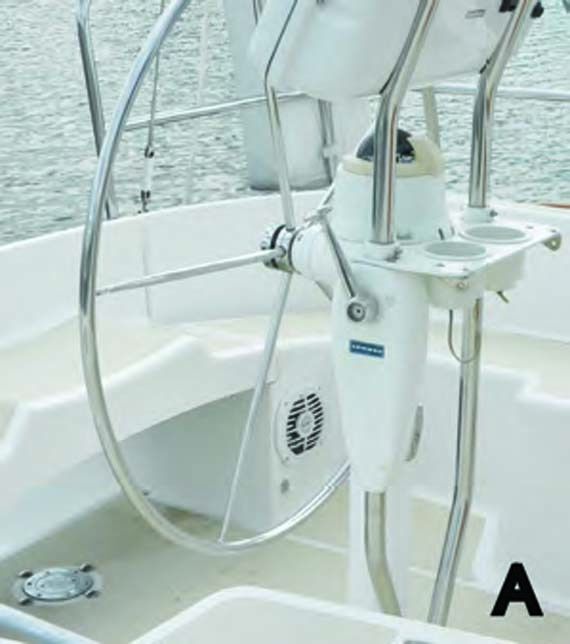 C: From a standing position behind the wheel of this racer-cruiser, the helmsperson cannot view the heading and steering course because the compass’s lubber line is obscured. 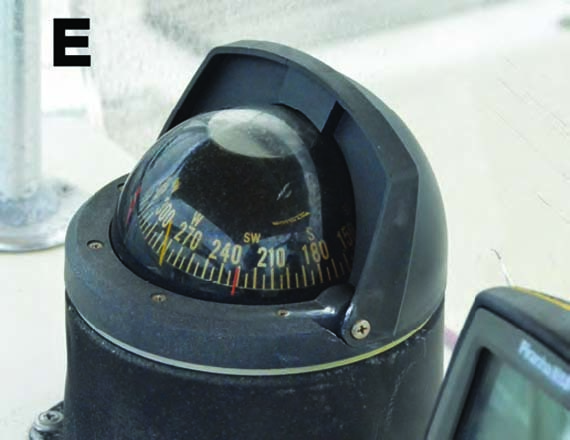 The lubber line is the mark at the compass 12 o’clock position, indicating on the compass card the boat’s steering course and direction of advance. 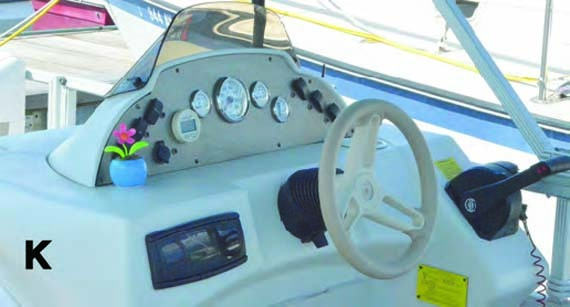 On this boat, the skipper is required to either a) squat to see the lubber line, b) steer by auto-pilot, or c) steer a GPS track (COG) and heading, rather than a compass course and heading. COG is Course Over Ground, or “course made good.” It is not real time, but based on historical data recorded during the immediate past few minutes; it is represented on the chartplotter display with three digits labeled COG and by a visual track. 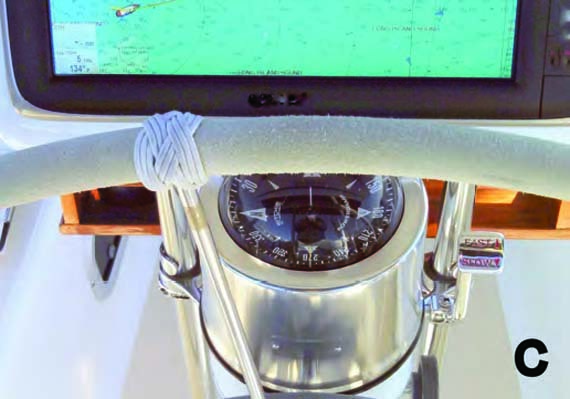 COG takes into consideration the vessel’s actual path – which may not be the desired heading or steering course – in response to the influence of subtle wind, current, and steering errors. It is often expressed as leeway, or cross-track error. Because your actual path may very well deviate from your intended compass course, serious navigators do not consider COG to be an accurate method of steering the vessel. Heading is better, but a compass is best. F: All the fluid has leaked out of this compass; the compass card is not stabilized; its motion is not damped and it swings erratically, This makes it difficult if not impossible to get a steady compass reading for steering or bearings. 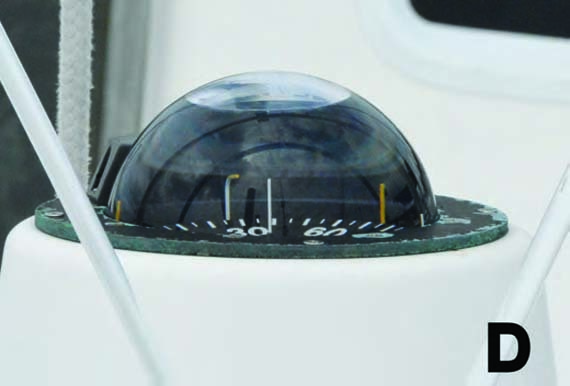 G: Almost all magnetic steering compasses used on recreational vessels have clear plastic domes that are filled with fluid such as a light machine oil, mineral spirits, or their equivalent. 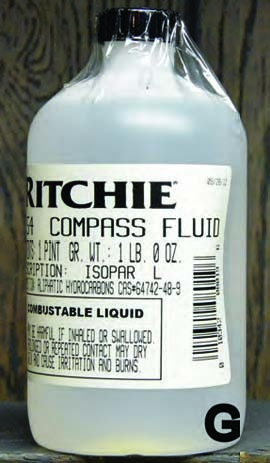 Some compass manufacturers fill their new compasses with a refined petroleum product called Isopar L, an odorless, colorless fluid. The purpose of the compass fluid is twofold: 1) to lubricate the compass card’s pivot point, and 2) to stabilize the card and dampens its movement as the boat turns and as the compass card swings. Because small, erratic changes are minimized by the fluid, card swings are smooth and steady, enhancing your ability to steer the desired course. The absence of oil in the compass dome is not a disaster, but may reduce the reliability of the compass and perhaps shorten its life. 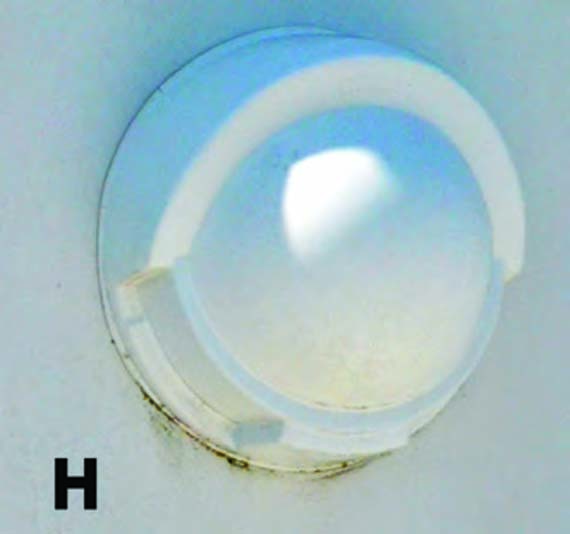 H, I, J: A compass loses oil because during hot weather, and when exposed to sunlight for long periods, the oil heats, expands, and creates pressure inside the dome. The expanding hot oil may be forced out through cracks in old gaskets, seals, and the diaphragm; it then evaporates. Later, when the compass cools, the fluid remaining within the dome contracts, drawing in air through the gasket cracks. While a compass may have a diaphragm or bellows designed to compensate somewhat for fluid expansion or contraction, it won’t stop a leak of oil or air. 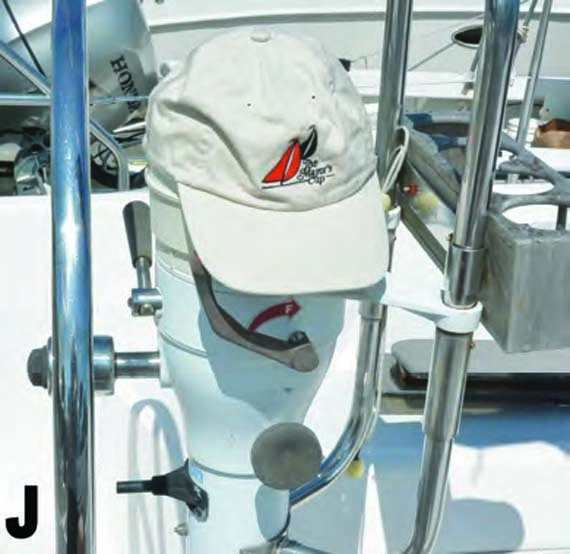 All this can be prevented by covering the compass (when not underway) to block the sun. 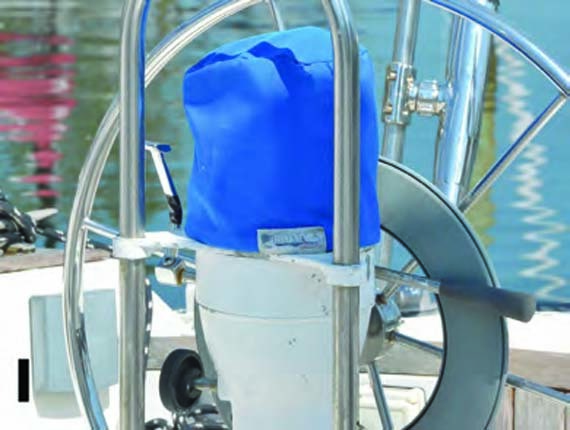 Absent a fabric cover for the entire binnacle, good protection is afforded with a hard plastic shell over the compass, a fabric compass cover, or even a personal cap. From his base in Stamford, CT, Bernie Weiss ( CaptainBernieWeiss@Gmail.com) has been finding his way at sea with compasses and more modern devices for 50+ years. He heads up AtlanticYachtDelivery.com and ConnecticutCompass.net. Captain Bernie also teaches navigation and other subjects underway and in class.